Be Life Ready® has one goal: to provide resources to guide and help people achieve their full potential. Through an understanding of specific Keys to Be Life Ready® and the use of practical tools to address those keys individuals will be better prepared to accept responsibility for and gain greater control of their lives. Based on information found in two books, It’s Your Decision, A Commonsense Guide to Making Better Choices, and It’s Your Decision for Teens, A Commonsense Guide to Making Better Choices, the Be Life Ready® Guidebook is designed for the reader to navigate through and create a more satisfying life. 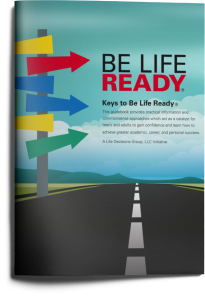 The Be Life Ready® Facilitator’s Guide and PowerPoint are designed to help anyone who is in a position to guide and influence others to confidently deliver a Be Life Ready program in a group setting by highlighting the Keys to Be Life Ready. The Guide emphasizes the Keys to Be Life Ready and highlights the tools that support each one and includes discussion questions for the participants to reflect upon throughout the Be Life Ready® process. A digital version of the Be Life Ready Guidebook can be downloaded for free, however, individuals, or other people planning to facilitate a Be Life Ready presentation in their community and want to provide each participant with their own book, can purchase softcover copies of the book. Be Life Ready® was created by Life Decisions Group, LLC based on an understanding that the quality of a person’s life is a direct result of the choices he or she makes. The more proficient a person becomes at making decisions that produce favorable outcomes, the more likely a happier, more successful life will result. All it takes is a willingness to commit time and energy to learn how to make the right choices. Be Life Ready® provides teens and adults with practical information and commonsense approaches which act as a catalyst for gaining confidence and learning how to achieve greater academic, career, and personal success. Be Life Ready® is committed to the widespread distribution of resources to guide and help people of all ages be better prepared and inspired to create more satisfying and productive lives. Teens, adults in transition, college students, veterans, immigrants, reformed prisoners, high school and college dropouts, current at-risk students, the unemployed, and those living in poverty on welfare can all benefit by learning how to attain higher levels of success. The Keys to Be Life Ready® focus on challenges people face pertaining to education, overcoming obstacles, life planning, making big-ticket decisions, personal and skills development, self-promotion, and job searching which upon addressing will benefit those who want to achieve their full potential. Be Life Ready® was launched in 2015 by Life Decisions Group, LLC, founded in 2008 by higher education career services professionals whose experience includes over 35 years as counselors, lecturers, authors, public speakers, and entrepreneurs who possess a passion for helping others and an understanding of how to guide and motivate individuals to achieve greater academic, career, and personal success.